I messed up in a public way for the first time at age 10. To foster the habit of saving, a credit union came to our school every month so kids could deposit money into their accounts. We were all given an account book so we could keep track of our deposits. One day, while playing with a neighbor, I suggested that Barbie deposit some money in “her” credit union account. My neighbor, one year my senior, swiftly told me that this was not the best idea. Undeterred, I falsified two $5 entries into “Barbie’s” account book. I knew this was wrong but, in my humble defense, 6 Trinidadian Dollars = 1 U.S. Dollar, so we are talking less than $2 U.S. dollars here. Having no criminal savvy whatsoever, I was promptly busted the following week when the uptick in my book’s balance wasn’t upheld by an uptick in my actual account. My seven-year-old daughter committed her first public gaffe a few weeks ago. During gymnastics class, she and another kid took a bathroom break. On the way back, they decided it would be a brilliant idea to pull the fire alarm. A junior coach came to tell me what had happened and asked me to accompany my daughter to see the safety officer. As I approached the front desk, I was mortified to find that my daughter had managed to make the one other black girl in class her partner in crime. “Dammit, little black girls!” I thought. “Don’t you understand that you are 100 percent representing black folks here at this gymnastics center!” But of course, they didn’t know that. Or at least my kid didn’t, as we had not yet had “The Talk.” But on that day, I would reveal to my daughter the burden that already lay on her shoulders without her knowledge. On that day, I took my daughter’s innocence away. The dilemma was more about optics than the act itself. I didn’t particularly care about the fire alarm pulling itself. It wasn’t a mean gesture, she didn’t attempt to hurt anyone, and she was probably just curious about what would happen if she pulled the lever. Technically, I can’t even say she defied me, as I had never explicitly said, “Don’t touch a fire alarm.” It was just a dumb move and kids do dumb stuff sometimes. But I did care about the optics: the only two black parents being summoned from the parent’s lounge to deal with an issue that the only two black kids had caused. When you are mainly surrounded by people of privilege and you realize that your struggles and daily experiences go all but unnoticed by them, you start to second-guess the validity of those experiences. So as I drove to the fire station, so my daughter could apologize for wasting their time and resources for having to respond to the alarm (regardless of the cancellation call), I questioned whether I was making too big of a deal of this. Perhaps “The Talk” was not even necessary right now, especially when my daughter was already upset? Parked in the fire station parking lot, deciding whether or not to go in, I thought of some of the white kids at my daughters’ schools who had a tendency to act up. The words I associated with their behavior were “high energy,” “rambunctious,” or “ADHD,” which I had no psychology degree to back up. But as I thought of the black kids who acted up, the words centered around “difficult,” “unruly,” and, a Trinidadian favorite, “No-brought-up-cy,” which means their parents were responsible for their lack of “home training.” Unconscious bias is insidious. Parents of color want to believe that we are above this, so it’s especially heartbreaking when we come face to face with our own internalized racism. Was I not the same person who railed against the media for calling a black kid with a gun a “thug” and a Muslim person with a home-made bomb a “terrorist,” but a white boy with an arsenal of automatic weapons, “a troubled lone wolf”? How did I not know better than to get stuck in this pitfall? Yet here I was. If even I judged black kids more harshly than white kids, how was I supposed to expect others to judge my kids differently? After the firefighters gave my daughter the VIP tour, versus the stern warning I would have preferred, we got back in the car and headed home. I so desperately wanted to drop the entire issue at this point. She apologized, the firefighters were overly gracious, all was well in the world…right? My relentless tears again betrayed my Pollyanna outlook. My daughter asked me what was wrong and apologized profusely again. She was now fully alternating between fear of what she perceived as my anger and fear that her mother had lost her mind but was still operating a vehicle. I pulled to the side of the road four blocks from our house, turned off the car, unbuckled my seat belt, and turned my entire body to face my daughter the way my mother did all those years ago. What followed was the awkward merging of parental love and the harsh reality of racism. I started off by telling my daughter that I was crying because I was sad, not because I was angry at her. I reminded her that I loved her dearly and unconditionally. I made it clear that pulling the fire alarm was not her best moment, and it was a waste of her community’s resources, but that I knew this would never happen again. She nodded vigorously. At this point, she would have agreed to give her right arm if she thought it would help me stop crying. Then I confided that there was something much, much larger at play here. I reminded her of our previous lessons about slavery, segregation, and unfair treatment of people of color—and black people in particular—adding that things were definitely better now, but still far from perfect. Staring into my daughter’s petrified face, I said through tears, “In a town like ours, that is so sharply divided by race and socio-economics, eyes are frequently going to be on you, as our biracial, two-mommy family is conspicuous and straddles and defies all divides. From your actions, you will sometimes be judged more harshly than your white peers and assumptions will be made not only about you but about people who share your skin color.” I lamented that this was an inequitable and absurd burden, but one that she, her sister, and I had to bear nonetheless. To bring the point home, I named two kids from a past school, one black and one white. Without saying why I chose those kids, I asked her to tell me how she and her friends talked about them. I pointed out that, while both these kids disrupted the class and could be physically rough at times, she had just described them quite differently. By this time my daughter, too, was sobbing. She unbuckled her seat belt and clambered between the two front seats to give me a hug. We held each other for a long, painful moment. I wept even harder because I had just opened her eyes to the ugly injustices of our country. This wasn’t our first talk about racism, but this was the first time she saw herself smack dab in the middle of the besieged group. Eventually, we both did our best to pull ourselves together and I drove the four blocks home to tell my white wife that our daughter may or may not be looking at her with side eyes for the next few days, while all of this sunk in. As an adult black woman, I have coping mechanisms for the biases and microaggressions I experience on a weekly basis. My worthiness and confidence backpacks are full. But when I think about the impact that unconscious bias and microaggressions can have on my still developing children, Mama Bear comes out fierce. 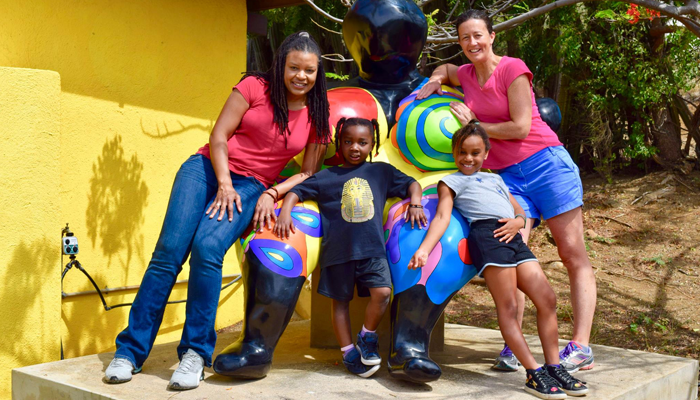 My kids don’t yet have the strong sense of self that I was able to develop in Trinidad, free of this soul-sucking and constant racism. As a parent, how do I teach my children that they are intrinsically worthy and capable of anything they put their mind and energy to, while at the same time alerting them to the fact that everyone in this country has been taught to discount their value? Growing up, I didn’t even use the word black to describe myself. None of my friends did either. My skin color didn’t define me or the way people viewed me. However, we were not color or culture blind. As a nation of African, Indian, Amerindian (Native Tribes), Chinese, Lebanese, French Creole and Portuguese descent, we celebrated all cultures, religions, and backgrounds without any ideas of appropriation. We just saw ourselves as one people; Trinis! But I am not raising my kids in Trinidad, so I struggle to learn what African-American parents have known and have been doing for generations in this country since they were enslaved. I stumble through the balancing act of ingraining in my daughters’ minds and hearts the idea that their worth is inherent and cannot be taken away by the things other people may think and say. I try to demonstrate to them how to thrive in spite of the additional burdens they will have to carry. I will be reminding them, again and again, that when the inevitable anger arises, to turn their anger into energy to create change and not let that rage eat away at them from the inside. As for Mama Bear, it seems I still have some work to do on that front, myself. 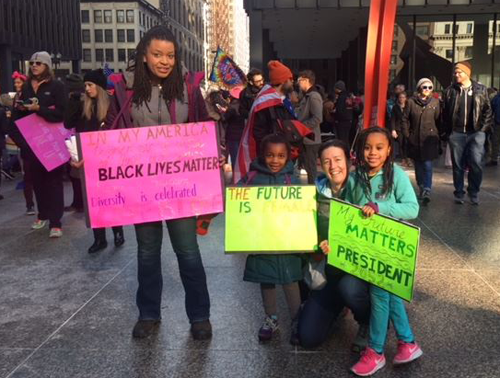 For the sake of my daughters, I will continue trying to model these ways myself, surrounding them with examples of #BlackExcellence and #BlackGirlMagic, so they can see their own limitless possibilities reflected in their world. KARLA THOMAS (@quadrant4change) is an activist and the mother of two children through adoption. Her work has appeared in Ruby Magazine, Medium, and on her own platform designed to elevate the voices of marginal groups, Quadrants4Change.com.